Hi friends I have lots of stuffs in my desktop so it’s very difficult for me to find what I want to use so I want to bring recent tab in my start menu of windows 7 ultimate how can I do it please help me. How I can hide "My recent documents" using windows XP professional from start menu? Re: How can I bring recent button in my start menu in windows 7? You can definitely bring the recent tabs in the start menu. You can use the control panel for setting the recent tab menu or you can right click on the start menu and can change the setting from the Properties options of the task bar. It will help you allots to works and you don't need to search for the icons to open the programmed. You can bring the recent button on to your start menu bar by dragging it into the task bar and also the recent button can be found by typing recent in the run menu and then you can view your files which are opened recently. In the Task bar ans Start Menu Click "Customize". Click on the "Use Default Settings". Click "OK" and Click "Apply". Open a Program or two and assure that the icons are showing in the recently Opened Items. now tick mark on "Store and Display Recently Opened Programs in Start menu &Store and display recently Opened items in Start Menu and the taskbar"
now click apply & OK button. then u can easily find witch program r recently open. It is very is to solve the problem of yours. First of all you need to menu and then right click on that and then go to the properties. select the Taskbar tab and choose to set the according to your requirement. 1`go to start menu and right click on it . 2. now click on properties. 3.now click on customize and click on use default settings. now after that click ok and the click on apply. >> Click on "Use Default Settings"
Now select All Control Panel Item. Go to Notification Area Icons. Now change the behaviors of the icons & click on OK to save changes. Organizing the Start menu can make it easier to find your favorite programs and folders. 1) Open Taskbar and Start Menu Properties by clicking the Start button , clicking Control Panel, clicking Appearance and Personalization, and then clicking Taskbar and Start Menu. 2) Click the Start Menu tab. Under Privacy, select the Store and display recently opened items in the Start menu and the taskbar check box. 3) Click Customize. In the Customize Start Menu dialog box, scroll through the list of options to find the Recent Items check box, select it, click OK, and then click OK again. 1. Go to start button & make right cleck on it. 2. From the context menu, select properties. 4. Click on "Use Default Settings"
6. Then finally press "Apply". You'll get waht you want. or you can try this try First unpinn all program from tadkbar anthen you can easily find oput with program or recenly open..
it is opedn one format another formating is WINDOWS button + after run command to choose that required sentence of condition is it easyu ly..
rr.jpeg......is aa Reset the option..
it is very easy guys.. If you want to bring Recent Button in your Start Menu. Then, you can bring it by following these simple Steps. 1. Firstly, right-click on Windows Button and choose Properties menu. 2. Choose, Start Menu tab and click on Customize button. 3. After that check the box of "Recent Items". 4. Finally, click on OK button to apply settings. 1)Right Click on the Start Button. 4) select "Use default setting". then there is a window will be displayed. A)dot,check and unchecked the settings for how you want them to look anmd behave in the start menu. A)click on the use default settings button at the bottom. -- Right click on the "Task bar"
-- Then select "start menu tab"
-- then after click on apply and ok.
<> There you can see the " Properties "
<> Then it will open a window and then Set to a "Default programs "
Finally click on "OK "
1.Firstly go to the location where that applications are installed. 2.Then you make a right click on the file which you want in the start menu. 3.Then you click on the option 'Pin To The Start Menu'. 4.If you cannot find that file in your system. 5.Then you open the start menu and then type that application name. 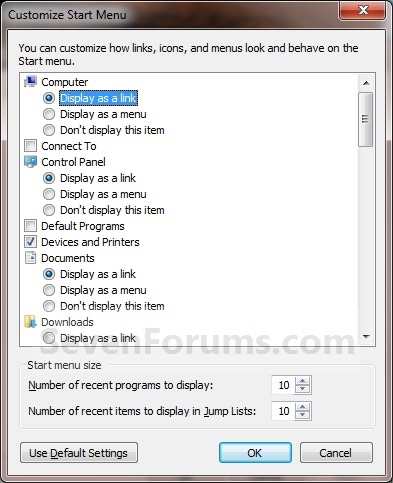 6.On that application make a right click and then click on the option 'Pin To The Start Menu'. Anyone really can get the current loss in first menu. You can use your key pad pertaining to placing the current tab food selection or you can right click on first food selection which enable it to get a new placing on the Components solutions from the endeavor bar. It will help a person allots in order to functions along with you won't have to look for for your emblems to open up your programmed. Right Click on your Start off Button. In the Endeavor bar ans Start off Menu Click "Modify ". Click on your "Use Standard Configurations ". Click "OK" and Click "Implement ". Open up a Application or a couple along with ensure that your emblems are generally expressing in the recently Popped Items. 1) Right - click on the Start button and click on " Properties " . 2) Then click on the " Start Menu " tab , then under the option " Privacy " check on the two options given b elow it , if they are unchecked , by clicking on the check box adjacent to them . These would help you in bringing all your recent programs or applications shortcuts to the Start Menu . Right click on Start menu Bar..
Set as user default settings. 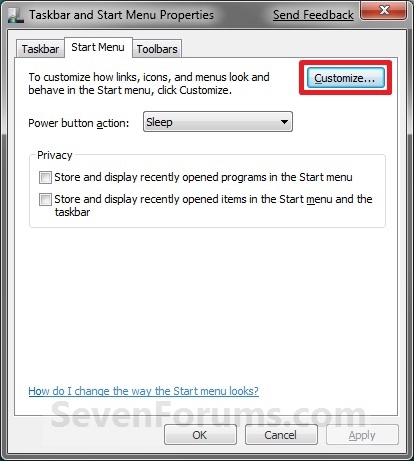 2)Right click on the start menu and can change the setting from the Properties options of the task bar. 3)By typing "recent" in the run menu and then you can view your files which are opened recently.